We’ll post interesting articles about aging services. Gay Men’s Health Crisis has long dedicated itself to providing services for the evolving needs of our older clients and the long-term survivor community. As part of this commitment, last year GMHC entered into a strategic partnership with ACRIA, a research and advocacy organization known for, among other important work, its pivotal 2006 Research on Older Adults with HIV (ROAH) study. That study helped change the way service providers address the needs of the older adult community. The newly formed ACRIA Center on HIV and Aging at GMHC continues this legacy of game-changing research with the ROAH 2.0 study, whose first report—focusing on San Francisco—was released last week. This new report demonstrates the unique challenges faced today by older adults living with HIV, helping to paint a picture not only of those challenges, but of the service needs presented by them. Among other findings, participants reported facing staggeringly high rates of mental health issues and levels of loneliness, as well as a strong need for more care coordination. Results from the full ROAH 2.0 study will include nearly 3,000 older adults living with HIV in five sites across the country. It will give new insight to providers—including GMHC—that will help us all continue to develop and tailor services geared specifically toward older adults all over the United States. More than half of all people living with HIV/AIDS in the United States are 50 or older—a statistic we take seriously, and one we are addressing by launching programs like the Terry Brenneis Hub for Long-Term Survivors, re-establishing our Buddy Program, and many other initiatives. We hope you will read the report to better understand this growing population and what we can all do to help its members. I know I’ll be doing the same. 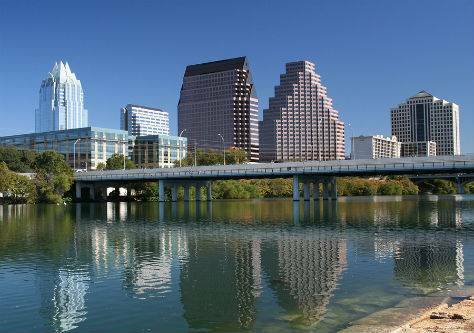 The website, Senior Advice, finds Austin the #1 city in the U.S. for Gay Retirement in an article titled: America’s Best Cities for Gay-Friendly Retirement by Lori Thomas. Click on the title to read the whole article. Using SeniorScore™, an unbiased, data-driven algorithm that determines the most accommodating places in America for seniors, we have determined the best cities in the country for retirees who identify with the LGBT community. The SeniorScore™ evaluates over 100 variables across multiple categories that are pertinent to an area’s older residents, including access to healthcare, social and recreational activities, general affordability, safety, quality of environment, and more. Additionally, we analyzed the overall LGBT populations per capita for each city, the presence of gay-friendly social environments, support for gay-owned businesses, and the overall level of tolerance and legal protection of the communities. Everyone and their pet poodle are moving to the Texas Capital but it’s not just young urban hipsters who find life here very inviting. Austin is a very progressive city where tolerance is the norm. Over 5% of the population identify as gay and there is a thriving social scene to go along with this large community. There is also a general acceptance of the LGBT community by the population at large and strong support for gay-owned businesses – there is even an Austin Gay & Lesbian Chamber of Commerce. But beyond the abundance of gay bars and a Pride Week that rivals those in many large coastal cities, Austin is also a political hub for LGBT advocacy. For outdoor recreation, it’s hard to top this charming metropolis. With tons of sunshine and warm weather, outdoor walking trails galore, urban swimming holes like Deep Eddy Pool and Barton Springs, and an overall focus on wellness, Austin is an outdoor lover’s dream. The city also boasts one of the best restaurant and bar scenes in the country, so there is never a shortage of interesting places to explore with friends after hours. Special Issue: Successful Aging Among LGBT Older Adults. to how LGBT older adults maintain successful aging despite the adversity they face. and mental health-related quality of life (QOL) and covariates by age group. 50–64; 65–79; 80 and older). with positive sense of sexual identity and negatively with sexual identity disclosure. of discrimination was particularly salient. and health initiatives tailored for this growing population. Today, as part of our continuing commitment to greater data transparency, Centers for Medicare & Medicaid Services (CMS) unveiled the Hospice Compare website. The site displays information in a ready-to¬¬-use format and provides a snapshot of the quality of care each hospice facility offers to its patients. CMS is working diligently to make healthcare quality information more transparent and understandable for consumers to empower them to take ownership of their health. By ensuring patients have the information they need to understand their options, CMS is helping individuals make informed healthcare decisions for themselves and their families based on objective measures of quality. Section 3004(c) of the Affordable Care Act (The Act) amended section 1814(i)(5) of the Social Security Act to authorize a quality reporting program for hospices. The Act requires hospice providers to report data to CMS on a number of quality measures selected through notice and comment rulemaking. The Hospice Quality Reporting Program (HQRP) includes both quality data from the Hospice Item Set (HIS) and Hospice Consumer Assessment of Healthcare Providers and Systems (Hospice CAHPS®). For more information, visit the Hospice Quality Public Reporting webpage. Other CMS Compare websites include: Inpatient Rehabilitation Facility Compare; Long-Term Care Hospital Compare; Hospital Compare; Physician Compare; Nursing Home Compare; Medicare Plan Finder; Dialysis Compare; and Home Health Compare. John Banvard, 100, and Jerry Nadeau, 72, are military veterans, and served in World War II and Vietnam, respectively. When they met in 1993, they were “sort of in the closet.” John’s wife of over 35 years had died nearly a decade prior and he had never been in a serious relationship with a man. Neither had Jerry. At first, the two seemed worlds apart. John was a lover of art and theater, while Jerry was an outdoorsman. But they hit it off and soon became inseparable. There’s a lovely interview with them on StoryCorps. Don Kilhefner, PhD is a Jungian Psychologist in Los Angeles. He has been an important figure in the field of gay psychology and psychological health since the beginnings of the Movement. He now champions the importance of Gay Elders serving as mentors for younger generations. He has a number of videos on YouTube under the name Gay Tribal Elder. 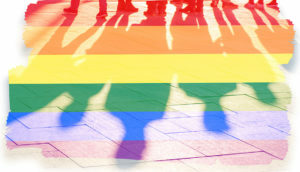 AARP has produced a major study titled “Maintaining Dignity: Understanding and Responding to the Challenges Facing Older LGBT Americans.” It’s a VERY impressive study. Here’s a link to the page at AARP for Maintaining Dignity. This link will download a pdf. More lesbians than gay men are living with a partner or are married. Gay men may be more isolated than lesbians. Bisexuals age 45 and over are less likely to be ‘out’ and can be harder to reach with general LGBT outreach compared to lesbians, gay men, and transgender community members. The gender expansive community faces unique challenges and increased fear of discrimination. Black and Latino LGBT Americans are more concerned about multiple forms of discrimination and negative outcomes as they age. Here’s a link to the report. Click here or on the image below. 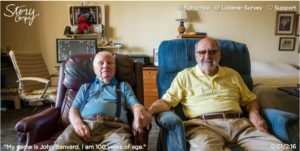 [CHICAGO, August 14, 2018] – LGBT and Dementia – a new issues brief developed by the Alzheimer’s Association and SAGE outlines the unique challenges facing LGBT older adults living with Alzheimer’s and other dementias and their caregivers. The brief outlines the unique issues that arise when Alzheimer’s disease, sexual orientation, and gender identification and expression intersect, allowing advocates and care providers to better meet the needs of LGBT elders and their caregivers facing dementia. It is estimated that there are 2.7 million LGBT people over age 50 living in the United States, and that number is increasing rapidly as baby boomers age and more people self-identify as LGBT. New research presented at the 2018 Alzheimer’s Association International Conference found that about one in 13 lesbian, gay or bisexual (LGB) seniors in the United States are living with dementia. Dementia rates for the LGB population are 7.4 percent, compared to about 10 percent for the general population. In support of the recommendations, SAGE and the Alzheimer’s Association are partnering to provide training to Association staff and chapters across the country, and SAGE is encouraging local collaborations that offer targeted support to LGBT older adults who have a dementia diagnosis and their caregivers.